‘An amusement in a weary world.’ How we spell our names and other words. ‘If I make a mistake I am scolded.’ said I. An eye-opener for me as well as for Penelope! I still wouldn’t advocate random spelling, but how wonderful to think that people might have seen it as a positive freedom rather than as something no one had yet given much thought to. I have really fond memories of this book, which I read when I was about 11 or 12, but hunting for it decades later I got distracted by several similar titles and themes. No, it wasn’t Daughter of Time – a 1951 detective novel by Josephine Tey with a historical puzzle: that’s about Richard III and the book I was after concerned Mary Queen of Scots. Nor was it A Stitch In Time by Penelope Lively (1976). She might be a well-known British author and it involves time travel, but back to the Victorian era. And it certainly wasn’t A Wrinkle In Time (1962) by American writer Madeleine l’Engle, although this one is incredibly widely-known – though not by me before I began this search! 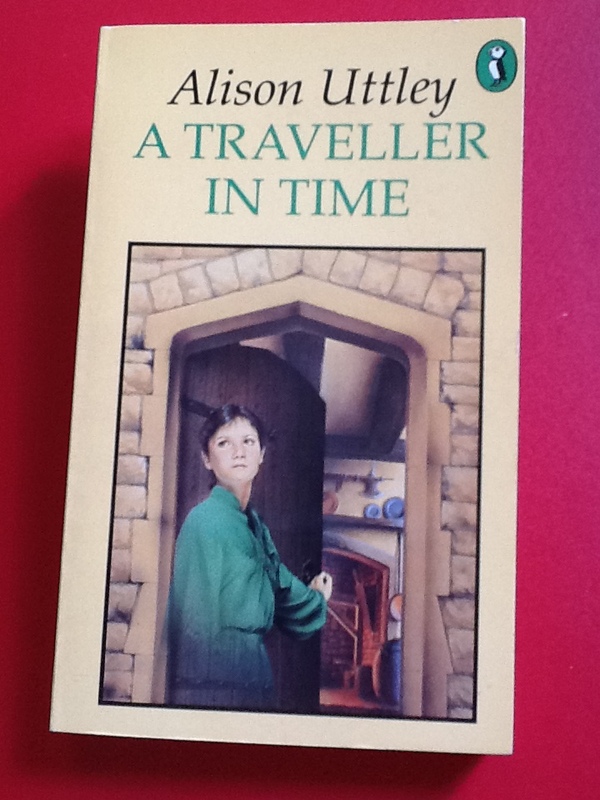 Then I lighted on A Traveller in Time and it turned out to be by Alison Uttley, famous for writing the Little Grey Rabbit books for younger children. My copy has a cover in a horrible shade of beige and a girl who looks as if she’s dressed in early-era droopy Princess Di, but inside are much more classic and appropriate illustrations by Faith Jaques. The magic I loved as a child turning into a teen was still there. Fey young Penelope, along with her older brother and sister, goes to stay with Great Aunt Tissie and Great Uncle Barnabus on their farm in a remote Derbyshire valley. They are London children and the winter has been bad; in true Edwardian style they are sent to the country to get the roses back in their cheeks. 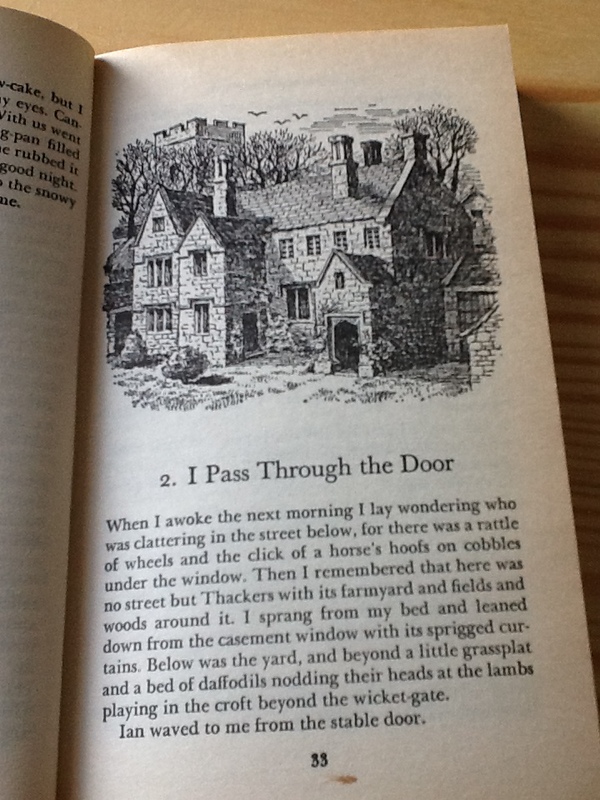 The idyllic countryside and the sensible rural ways of Tissie and Barnabus are a strong reminder of the charms of Little Grey Rabbit, but this is a book for an older audience. It didn’t stop me wallowing during the early chapters – as Penelope does – in the slow and gentle farm and kitchen life that has hardly changed in generations. Uttley has based it on the farm she grew up on and seems to remember everything. She delves into sensory detail, bringing back every touch and taste and smell. But then an odd thing happens: Penelope steps through a door and into another time, the era her aunt and uncle hark back to often, without being aware just how long ago it was – the dangerous times when Elizabeth held the throne and Mary Queen of Scots was imprisoned nearby. The farm is the remains of Thackers, an old manor house owned by the Babington family, Catholics and passionate supporters of Mary. Penelope knows from history that their plans are doomed but gets caught up in their lives and dare not say too much. Her watch stops whenever she slips back to the 1580s and, try as she might, she can’t control when her time-trips happen. 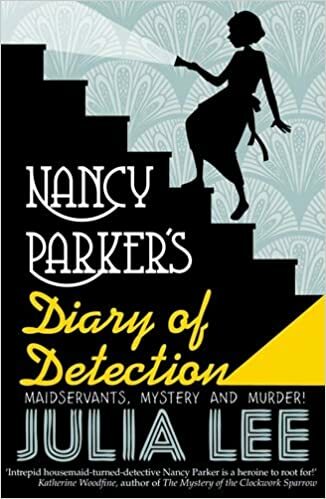 In the past, everyone accepts her as Penelope Taberner, niece of Mistress Cicely, the housekeeper (an Elizabethan dead-ringer for Aunt Tissie) and her strange ways and garb are put down to being a Londoner. Everyone, that is, except the dogs who slink and shiver as if at a ghost, and a deaf-and-dumb servant-boy who watches her in terror. So far, so typical of time-slip fiction, but since this was first published in 1939, I imagine it’s an early template and Uttley handles it deftly. A locket lost in the past and found in the present cannot be returned to its own time and serves as a poignant reminder to Penelope that she can do nothing with her knowledge to help those she comes to love. The author links both eras through implements that still exist in the farm kitchen: the ancient warming pan was a new-fangled gadget in the Babington household, the bread oven has been turned into a cupboard, yet the kitchen fireplace and the great best bed are the same. Springs, barns, and views are familiar, and the fields still bear their old names which feature in Anthony Babington’s will: Westwood, Squirrels, Meadow Doles. I loved the details of both early 20th century and Elizabethan rural life – it was rather like an episode of Tudor Monastery Farm! I did question how Penelope’s Elizabethan friends so happily accept her odd coming and going – not easy for a young girl to pop back to London in those days – and get to know and trust her so thoroughly, but Uttley addresses this. Penelope has some idea that she visits more often and for longer than she is conscious of, perhaps in her sleep. And there is a dreamlike quality to the visits: she can hardly remember her present-day life when she goes back in time. Sometimes in her ‘real’ life she sees or hears figures from the past alongside the present, like an overlay, as they and she inhabit the same spaces but in different yet parallel times. And she’s shattered to find a ruin when she is taken to visit nearby Wingfield, another old manor house she first encounters in its heyday when Queen Mary was kept there. As someone who always tries to pick up the atmosphere when visiting historical sites, longing to know what it was ‘really’ like way-back-when (Get out of the way, tourists! ), I liked this meditation on old houses which have seen a great deal of history pass by. And I do enjoy novels which use objects to link different eras and characters. When I read this book as young teen I found the budding friendship between Penelope and young Francis Babington much more romantic than this time round. In fact, for the first half of the book Penelope is quite a young child. It’s only on her return visit to Thackers several years later that a different kind of friendship blossoms, and it is very low-key. The droopy frock featured in the cover illustration is meant to be Penelope’s best dress of green taffeta: Francis sings ‘Greensleeves’ to her because of it. A Traveller In Time visits all the seasons, but ends at Christmas in the snow, making it a great book to read at this time of year. Amidst the tense drama of the ending Uttley describes the yuletide preparations, feasts, and carol-singing of both Tudor and Edwardian eras. 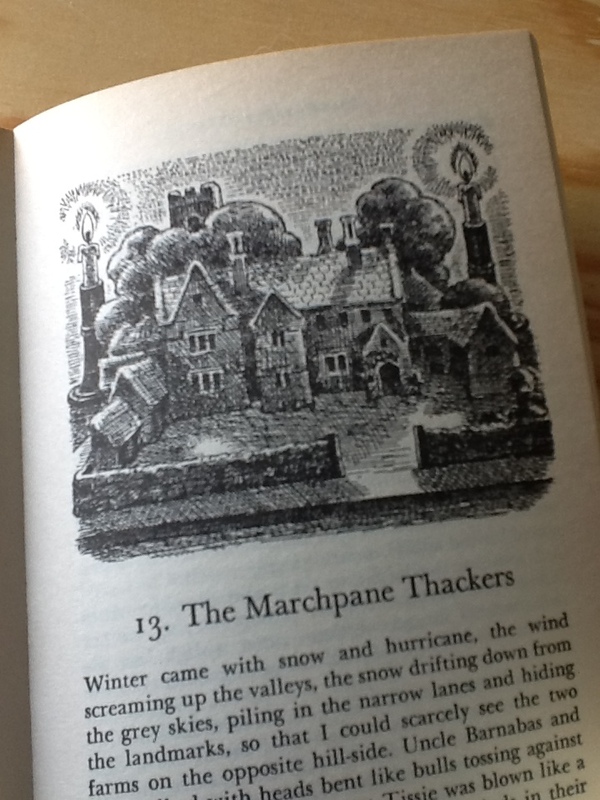 Penelope even gets to make a version of Thackers in marzipan, and it was here I first learned its lovely old-fashioned name – marchpane.